It's Free Spins Week at Juicy Stakes Casino next week! You can get get free spins on a new game and some Betsoft favorites and all you need to do is deposit and play. 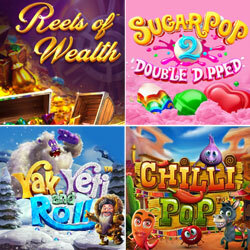 Featured games include the brand-new Yak, Yeti & Roll and the super sweet Sugar Pop 2: Double Dipped slot games. A sequel to one of Betsoft's most popular games ever, Sugar Pop 2: Double Dipped has everything you loved about the original -- like cluster wins and candies that explode in a cascade. But the new game also has new features that you'll be sure to love, like a Morphing Golden Wild candy and a Jelly Bean Cannon. Clusters of a special Free Spin candy trigger Free Spins. Five or more explodes a Candy Bomb that clears a large portion of the board making way for massive wins. During Free Spins Week, you can also get free spins on Chilli Pop and Reels of Wealth. The larger the deposit, the more bonus spins are awarded – up to 100 with a $100 deposit. "Yak, Yeti and Roll is Betsoft's newest game," said Intertops Poker's casino manager. "Sugar Pop has always been a player favorite so I'm not surprised that the new sequel has been such a hit as well."